Our company was originally founded by Michael Prescott snr after being in the industry since the early 70’s, Michael started his career as an apprentice at national tyres were he progressed through the ranks till he reached management status in the later part of the 70’s. Having absorbed a vast amount of knowledge through his time in management and in the workshop environment he decided the time had come to move on and establish a tyre company of his own. So in 1988 Michael bought from Pirelli a established tyre garage in the Pemberton area of Wigan. From here this is were Michael established himself as an experienced and highly trained owner of a very thriving business. As the business grew Michael encouraged his son Michael jnr into the business. When Michael jnr entered the business he decided to take the extra step and step into the performance car market, from there Michael jnr has gained a lot of knowledge about all aspects of the performance market due to him becoming a representative for companies such as Toora, MB Wheels and Radical Wheels, as well as this Michael jnr has gave his expertise to many cars which have appeared in various magazines and shows. As the business grew further due to the demand of performance parts and the growth of the alloy wheel market. Michael jnr expanded the company and purchased a second site in which he could run a specialised performance centre. Michael jnr purchased the Enfield Street Garage which was established in 1926 to be the home of the performance centre. Since opening the performance centre in the early part of 2004 the company has gone from strength to strength and now catering for a vast amount a standard and high performance modified cars specialising in alloy wheels, performance exhausts, performance suspension and tyres. 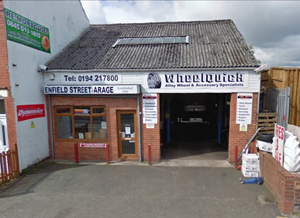 Wheelquick is the leading supplier and repairer of Alloy Wheels in the UK. We have an excellent range of wheels at Internet Prices. If you cant find the wheel you are looking for just ask. Wheelquick use the Latest Technology and Equipment to Build, Inflate and Balance all Alloy Wheel and Tyre Packages.